Lancaster knows that a beautiful tan is the result of high quality protection. 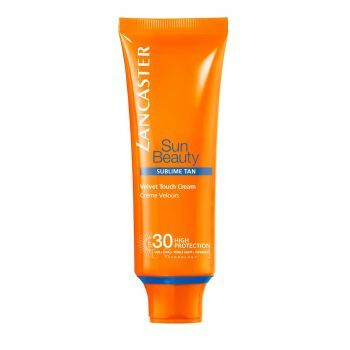 Today, Lancaster offers its broadest sun protection ever in a new generation formula that combines optimal UVA/UVB protection with new Infrared Technology, to further protect skin beauty from sun damage. Lancaster Sun Beauty Velvet Touch Cream Radiant Tan SPF30 provides an ideal golden tan while maintaining firmness and elasticity. Lancaster Sun Beauty provides efficient, optimally combined UVA/UVB filters and, for a more complete protection, exclusive Infrared Technology. To ensure you an ideal tan, these new generation formulas carry the latest version of Lancaster`s Tan Activator Complex (T.A.C. ).